They waited for "one last thing" at Nvidia's press conference, but it never came. Instead, the graphics chip maker devoted its entire press event at the International CES Sunday night to technologies that will power the car of tomorrow. At a show where smartphones, tablets and other portable gadgets make many of the headlines, Nvidia mentioned none of those things in its 90 minute presentation here, despite making chips that target them all. Not even its own Shield gaming device got a look-in. "The Nvidia press conference is a teraflop," moaned one tech reporter on Twitter, after CEO Jen-Hsun Huang spent half an hour explaining the machine learning techniques that Nvidia's new Tegra X1 chip will use to power autonomous driving systems. "Nvidia, are you making a car or can I go to bed?" demanded another impatient scribe. It isn't making a car, and Sunday night's press conference probably won't be the most exciting we'll see at CES this week. But the focus on auto technology makes sense for Nvidia, whose powerful Tegra chips have been finding more success on the highway lately than in your pocket. "That's where they're shipping most Tegra chips today, in automotive," said Jim McGregor, industry analyst at Tirias Research. None of the big three tablet makers depend on Nvidia for their products, he noted. Apple makes its own CPUs, as does Samsung, although the Korean company uses Qualcomm's Snapdragon processors as well. And Amazon has no allegiance to any chip vendor for its Kindle. 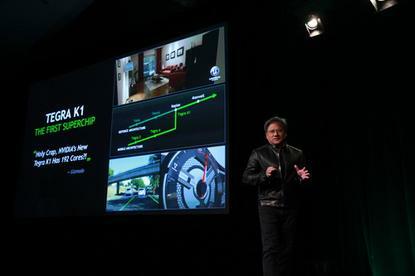 That explains partly why Nvidia is doubling down on car technology at CES. It's gained an early lead in the market for powerful in car computing systems, and it's an area where it can differentiate itself from the competition. The chip maker announced a new chip Sunday called the Tegra X1, which it says provides double the performance of its current Tegra K1. The X1 is based on Nvidia's newer Maxwell GPU architecture and is its first mobile chip to perform a trillion operations per second, or a teraflop of computing. It will be used in two computing platforms for automobiles that were also unveiled Sunday. One, called Drive CX, will allow auto makers to design slick instrumentation panels that can change their surface texture with the touch of a button and make the driving experience look like the movie Tron. The other, called Drive PX, ties two Tegra X1 chips together and provides the computational might to process images from a dozen external cameras around a car, analyzing the data to identify upcoming objects for driver assistance technologies and, eventually, self-driving cars. That processing work employs machine learning and neural network techniques also being explored by Google and Facebook. They'll allow car computers to identify traffic lights, pedestrians and other upcoming objects, and can improve their image recognition with practice over time. "There will be more computing power inside your car than in any device you have today," said Huang, who was joined by a representative from Audi, which will use the Tegra X1 in its vehicles next year. The demonstration seemed labored to some in the audience, but Nvidia is betting on a technology with a good future, McGregor said. "For better or for worse, we're turning our cars into computers," he said. The advances will almost certainly lead to greater road safety, but they could also require more maintenance and upkeep. "Electronic systems are just more fragile than mechanical systems," he said. Patrick Moorhead, industry analyst at Moor Insights and Strategy, was also surprised to see Nvidia focus exclusively on auto tech, but he doesn't think the company is backing away from portable devices. The Tegra X1 performs well enough at around 4 watts that it can be used in high-end tablets in the future, Moorhead says, and he expects Nvidia to use the X1 in its own Shield gaming system. The decision to focus on auto tech at CES was a strategic one, he said, even if it gave some the impression that Nvidia had lost sight of the big picture. Both he and McGregor think Nvidia will make mobile announcements at the Mobile World Congress show in Barcelona in March. "There's nothing that led me to believe they're not still looking at mobile as well," Moorhead said. Still, the Tegra hasn't been as successful in smartphones and tablets as Nvidia would like, which also helps explain why it initiated its first ever lawsuits this year over patents, accusing Qualcomm and Samsung of infringing its GPU technology in their mobile processors. Nvidia probably wouldn't have launched that action if it was making more headway in smartphones and tablets, Moorhead said. And it might not have spent 90 minutes Sunday night discussing car computing.